Environmental Activities [Environmental Enlightenment] | CSR | MURATEC,MURATA MACHINERY, LTD. In order to construct sustainable society, it is important that each individual person cares and has knowledge about environment and environmental problems, voluntarily takes part in creative activities for better environment, and takes responsible action for environment. For this, based on the education and training plan for the environmental management system, Muratec trains its employees to be able to have a strong consciousness of environment and act specifically. 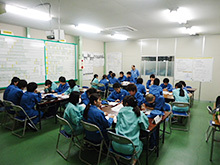 In particular, general training for the environmental management system, environmental laws and regulations, and environmental goals and rules is provided, and basic training for workers who engage in the work which may cause significant environmental effect, special training for workers who engage in the work specified by the laws and regulations, auditor training for internal environmental audit and other training are provided. In addition, other trainings such as the approach to CO2 reduction are provided. 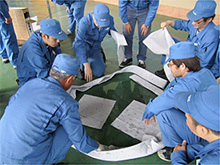 Practice for relevant supervisors and workers is conducted assuming that hazardous liquid is leaked out. The practice is conducted as planned, so that the flow is reviewed to reduce damage, and action with common view is discussed. Also, environmental awareness is improved through these types of practice. "Environmental patrol" is conducted mainly by members of the Environmental Management Secretariat once every month. 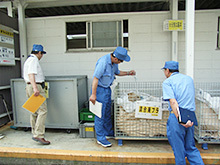 During the "environmental patrol", whether industrial waste is properly separated or not, and measures for power saving such as the proper temperature settings for the air conditioners, compliance with the proper brightness and power-off of the computers during unused time period are checked while this patrol creates opportunities to improve environmental awareness of each individual employee. In case any defect is found by the patrol, not only submission of improvement report to the secretariat is obliged, but all employees are also notified of the defect in a general meeting to prevent recurrence.